1. MTR West Rail to Tsuen Wan West Railway Station. All buses are equipped with visual and audible next bus stop announcement systems. Octopus Card can be used on all transportation in this tour. TRAVELLING TIME – approx 2 hours from beginning to end of route excluding time spent at any optional sightseeing stops. To complete the tour including all the suggested visits along the route allow 5 hours. TO GET TO START OF TOUR – take the MTR West Rail to Tsuen Wan West MTR Station (not to be confused with Tsuen Wan MTR Station, some distance away). At Tsuen Wan West Railway Station take Exit C for Tsuen Wan West Station Bus Terminus, which is located above the station. TSUEN WAN - is a rapidly changing New Town and with its excellent rail and bus links to Kowloon, HK Island, the airport and other parts of the New Territories and the opening of the large L’hotel Nina is attracting an increasing number of tourists. In the immediate vicinity of the MTR station a waterfront park alongside the Rambler Channel is being developed with views of the Ting Kau Bridge and close by Hong Kong’s first “green” shopping mall, Citywalk, has recently opened featuring a vertical garden. Some 10/15 minutes walk away close to Tsuen Wan MTR Station is the Sam Tung Uk Museum, housed in a restored traditional Hakka walled village with an ancestral hall, period displays, an exhibition hall and landscaped garden (free admission, open 09-00 to 17-00 daily except Tuesdays. From Tsuen Wan West Railway Station Bus Terminus take KMB (single deck) Bus 51, a circular service via Route Twisk and Sheung Tsuen Bus Terminus, an interchange point for the next stage of the journey. The bus operates at an hourly frequency at 20 mins past the hour from Tsuen West Station on Mondays to Fridays and 15 minute frequency on Saturdays, Sundays and public holidays. 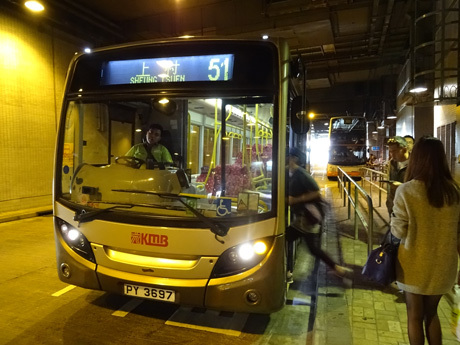 Route 51 previously operated to Kam Sheung Road Station but in October 2014 became a circular service with Sheung Tsuen Bus Terminus becoming an interchange point for services to Kam Tin and Kam Sheung Road Station. 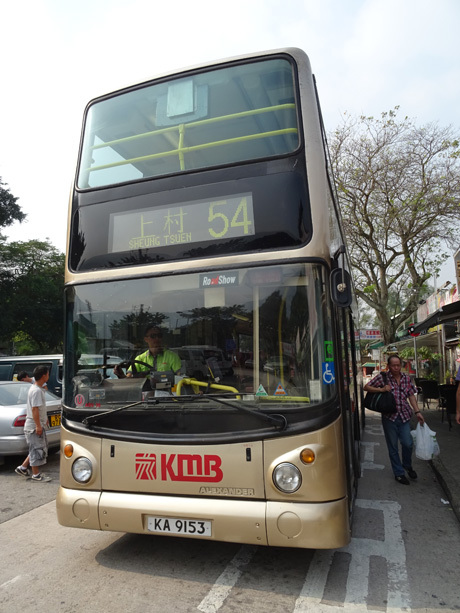 KMB route 51 bus travels a circular route via Route Twisk and Sheung Tsuen Bus Terminus, an interchange point. 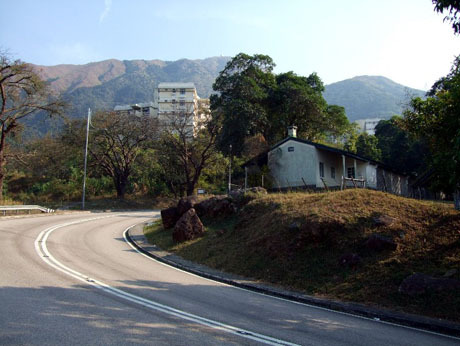 The bus quickly reaches Tseun Kam Interchange in the suburbs of Tsuen Wan and starts the long twisting climb along Route Twisk, a former military road built by the Royal Engineers as an escape route for personnel from the British Army base at Shek Kong further along the route. The road was opened to the public in 1961. 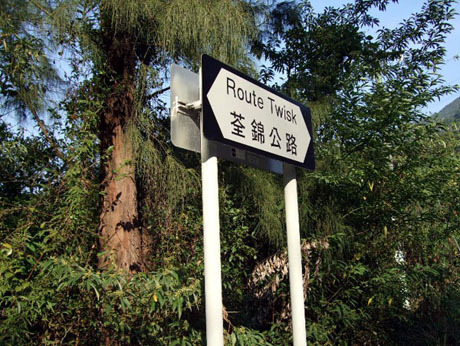 The name TWISK is an acronym for “Tsuen Wan Into Shek Kong”. As the dwellings become more and more sparse the road is flanked by forested hills on one side rising to Tai Mo Shan, Hong Kong’s highest peak whilst looking down there are panoramic views of the Tai Lam Valley and reservoirs below. The road passes the entrances to the Tai Lam and Tai Mo Shan Country Parks crossing the MacLehose Trail. The road begins to descend through Shek Kong Camp, Chinese Peoples Liberation Army base, previously occupied by the British Army until Hong Kong’s reunification in 1997, past barracks and accommodation huts on both sides of the road and the airfield. 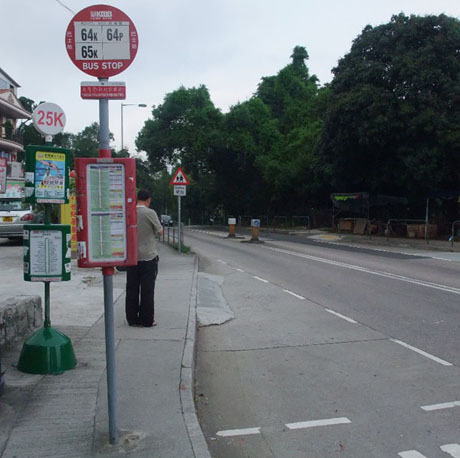 At the end of Route Twisk the bus reaches Shek Kong Village and the main Yuen Long to Tai Po Road. After a short distance the bus reaches Sheung Tsuen Bus Terminus, the interchange point for the next stage of the journey. From Sheung Tsuen Bus Terminus take either bus 54 or 251B. Both are circular services. Bus 54 operates at about 20/25 minute frequency and bus 251B, about every 15/20minutes. From Sheung Tsuen the road suddenly becomes far less scenic and is disappointingly lined with scrapyards, plant hire contractor’s depots and other industrial buildings. Get off the bus at the stop as "Kat Hing Wai" which is two stops after the stop identified as "Kam Tin" and one stop after "Kam Tin Market". The remains of old walled village are on the same side of the road as the bus stop and there are tourist signs pointing to it. KAT HING WAI is one of two remaining ancient walled villages in Kam Tin. The village was built during 1465-87 in the Ming Dynasty and the six metre high walls were added in the early Ching Dynasty. It is a typical walled village and is still inhabited but today is surrounded and overlooked somewhat incongruously by modern buildings. The majority of inhabitants of Kam Tin belong to the Tang Clan, one of the Five Big Clans of the New Territories but there are alos Hakka villagers to be found here. 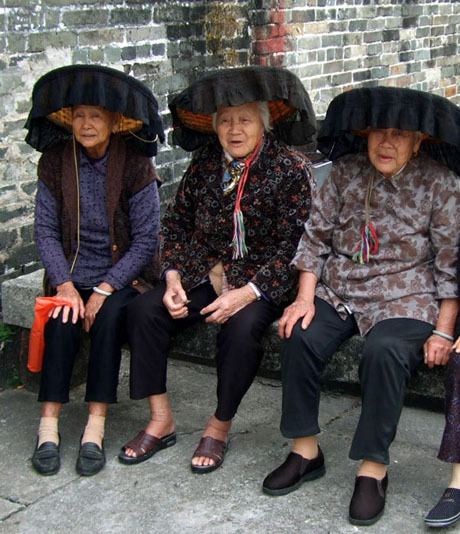 Hakka ladies in traditional black costume and hats usually sit outside the village entrance and will pose for pictures for a fee, HK$10 per picture is the norm, otherwise they will hide their faces. A voluntary donation of HK$3 which you put through a slot in the wall is requested to enter the village and walk along the narrow streets. From Kat Hing Wai continue walking in the same direction along Kam Tin Road (away from the bus terminus) but cross to opposite side of the road and in about 150 metres (just past the junction of Kam Tin Road and Kam Sheung Road) is the bus stop for the KMB 64K bus and the next stage of the tour. This bus stop is identified as "Mung Yeung School" bus stop. However before catching the bus take the opportunity to visit Shui Tau Tsuen. 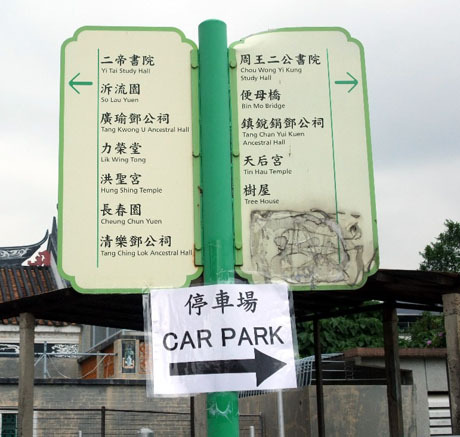 Next to the bus stop are tourist signs for Yi Tai Study Hall and Kam Tin Tree House. These are located at Shui Tau Tsuen which is Kam Tin’s other walled village and is more substantial and has more buildings than Kat Hing Wai. To get there follow the tourist signs to Yi Tai Study Hall which is about 10/15 minutes walk across the Kam Tin By-pass. SHUI TAU TSUEN - The original settlement dates back to the early 12th century but most of the buildings now remaining in the village were built in the 17th and 18th centuries. Many of the buildings have colourful decorated roofs with fish and dragon figures on the ridges. 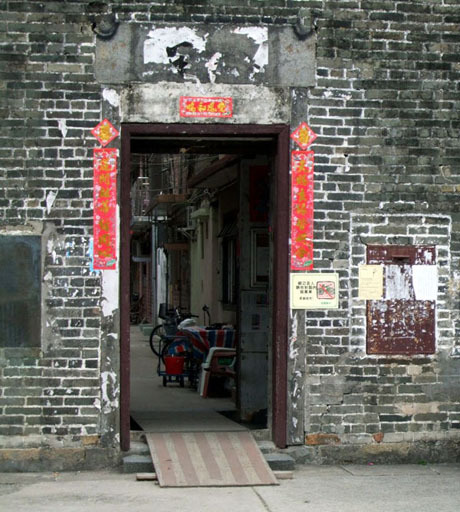 At the entrance to the village is the restored Yi Tai Study Hall with its moon shaped wall openings. When this hall is open (Wed, Sat and Sun and Public Holidays only 09-00 to 13-00 and 14-00 to 17-00) you can obtain a free guide map which details a heritage trail through the village. This trail passes two other Study Halls, shrines, an ancient well, ancestral halls, a tree house (a Chinese Banyan whose roots and trunks have grown around a stone house), Tin Hau Temple and stone bridge. At other times the village is still an interesting place to wander around but many of the buildings are not clearly marked and can be difficult to identify. Allow at least one hour for the diversion to visit the village. There is a small cafe next to the Yi Tai Study Hall. The trail through Shui Tau Tsuen passes several historic buildings. Some can be difficult to find but printed trail guides are available at Yi Tai Study Hall on opening days. The Kam Tin Tree House - on the trail through Shiu Tau Tsuen is an old banyan tree whose aerial roots and trunk have completely enveloped a stone house with its roots sinking in to the brick walls and granite door frame. Some say the house was a Tin Hau Temple, others claim it was a study hall. The owner of the house is believed to have left during the Ch'ing Period following an imperial edict on coastal evacuation and never returned. The house fell into disrepair and as the tree grew bigger and bigger it wrapped itself around the house. After visiting Shiu Tau Tsuen retrace your steps to the 64K bus stop. The bus (which originates at Yuen Long and terminates at Tai Po Market Station) operates a frequent service at 8/11 minute intervals until midnight. 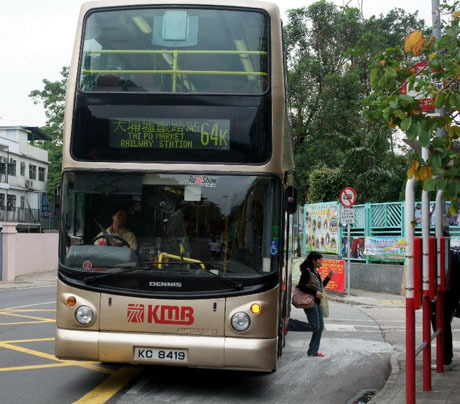 Immediately after boarding, the bus turns right and travels along Kam Sheung Road and soon after leaving Kam Tin the journey becomes more rural as the bus passes small settlements and skirts the northern fringes of Tai Lam Country Park. 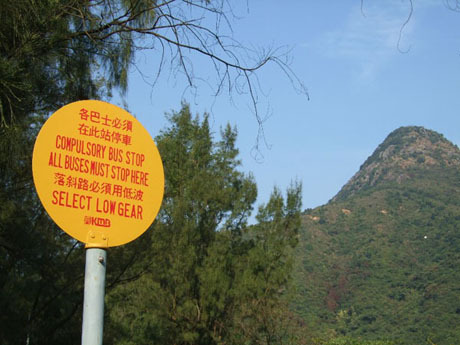 The bus passes the junction with the northern end of Route Twisk and enters the Lam Tsuen Country Park and in a short distance on the right passes Kadoorie Farm and Botanic Garden on the slopes and foothills of Hong Kong's highest mountain Tai Mo Shan. However, these wonderful gardens deserve at least a half-day visit in their own right. The route continues past forested hillsides with streams and waterfalls before descending into the picturesque Lam Tsuen Valley. Here there is more of a feel of rural China in what was once a large rice growing area as sparse buildings, vegetable gardens, nurseries and small plantations are dotted across the valley. 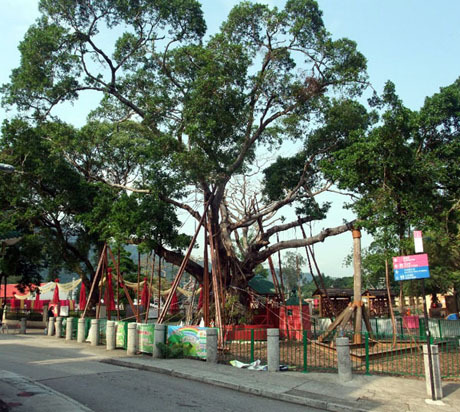 At Fong Ma Po (about 40 minutes into the journey) there is the opportunity to interrupt the journey and visit the famous Lam Tsuen Wishing Tree. LAM TSUEN WISHING TREES – Bus stop names are displayed inside the bus and as soon as the bus leaves a stop the next stop name is displayed in Chinese, then English then Chinese again. The English display, however, is very brief and passengers need to watch carefully when trying to identify a stop. The stop for the wishing tree is identified as “Fong Ma Po” (the previous stop is “Chung Uk Tsuen”). The wishing tree is within about 20 metres of the bus stop and is surrounded by railings. The original tree was destroyed by fire in 1998 and its replacement collapsed. The current banyan which is now in poor health has been there since 2003. 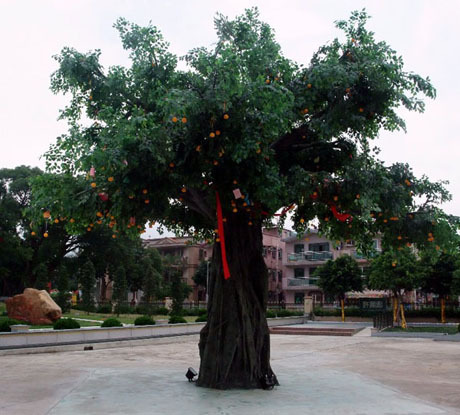 However since a branch fell off injuring two people in early 2005 the practice of luck-seekers tossing messages attached to oranges into the tree has been banned and the branches have had to be propped up with poles. Messages can now be attached to a nearby board or hung on poles. At Chinese New Year 2009 a temporary plastic tree was erected to allow visitors to revive the tradition of tossing wishes into the tree and in late 2009 a permanent seven-metre tall fibreglass tree costing HK$300,000 was erected. 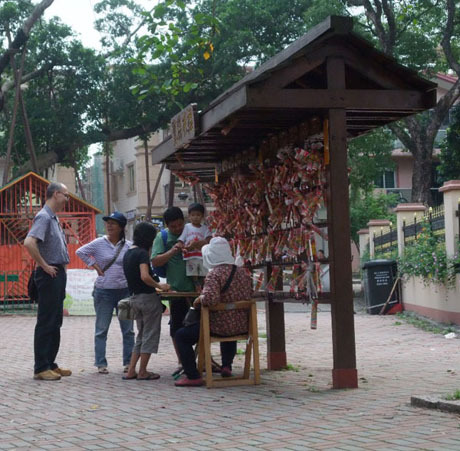 There is a second smaller "real" banyan about 100 metres away from the main tree which has been adopted as a second wishing tree and just beyond is a Tin Hau Temple. 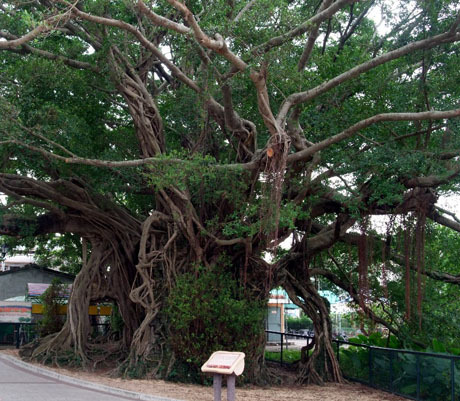 In March 2008 a transplanted 100 year old mature banyan from a private park in Zengcheng, Guangdong province was planted next to the ailing tree which in accordance with ancient tradition will help heal its neighbour. Once in each decade Lam Tsuen is home to the lavish six-day Tai Ping Jiu festival, also known as Da Jiu, in which participants pray for peace and thank the goddess Tin Hau for giving good weather and fruitful harvests to the villagers. 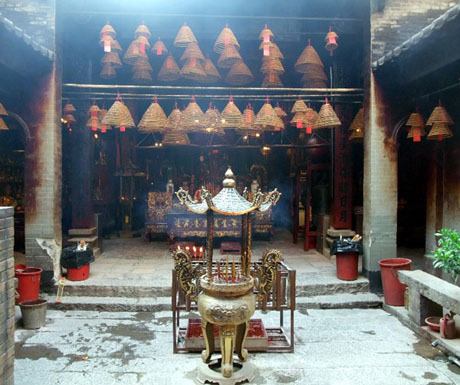 The festival which features opera singing, lion dances, festive food and a daily ritual of praying by Taoist priests was last held in November 2008. 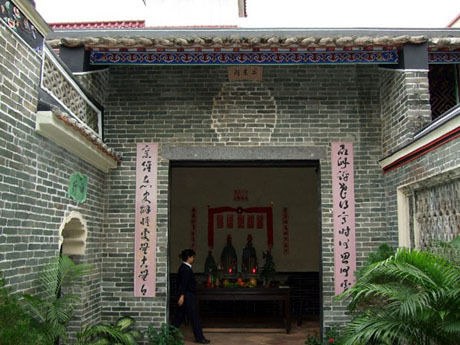 During 2008/2009 tourist facilities were enhanced with construction of a "wishing square" with a wishing tower, 12 wishing statues, astrological signs and a museum converted from an old school. Some of the buildings in the vicinity of the trees have decorative roofs similar to those at Shui Tau Tsuen and there are still some old Hakka dwellings scattered along the valley. Close to the Tin Hau Temple is the attractive “up market” Lotus Courtyard Restaurant with its colourful garden and lotus ponds. TAI PO - is a busy new town developed around and incorporating the old town of Tai Po Market. The area, which is close to the mainland border, is home to many Chinese immigrants and has more the feel of a Chinese town to it than other new towns. There are pleasant walks alongside the Lam Tsuen River which runs through the town centre and there is an attractive waterside park where it meets Tolo Harbour. 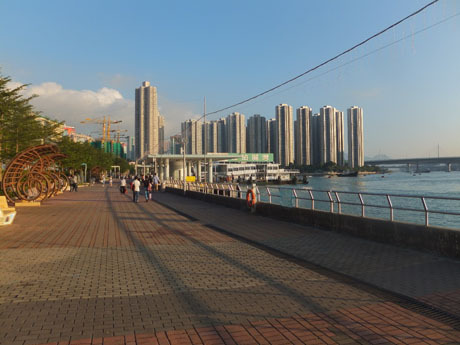 The splendid WATERFRONT PARK is about 10 minutes walk away and can be reached by walking east from the bus terminus, under the railway bridge, along Nam Wan Road and crossing the nullah to Kwong Fuk Estate which is linked by footbridge across the Lam Tsuen River to the park. 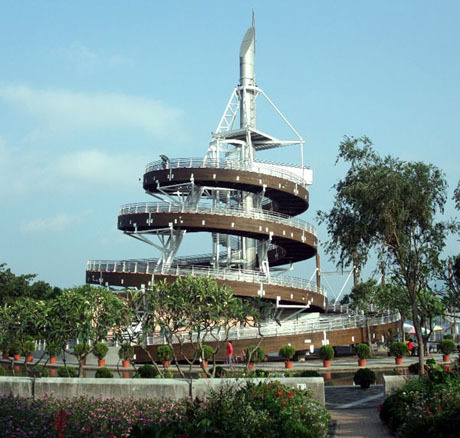 The park has a lookout tower with wide spiral boardwalk leading up to a viewing platform with panoramic views over Tolo Harbour. On Fu Shin Street, about 5 minutes walk from the bus terminus is TAI PO MARKET (open daily 06-00 to 20-00), a large traditional outdoor wet market and a splendid and busy MAN MO TEMPLE (open daily 06-00 to 20-00) with its two worshipping halls. About 5 minutes walk from Tai Po Market MTR Station on Shung Tak Street is the HONG KONG RAILWAY MUSEUM (open daily except Tuesday, 09-00 to 17-00, free admission). 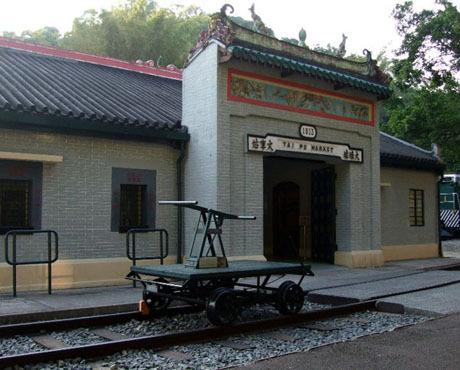 The small museum is housed in the excellently preserved buildings of the old Tai Po Market Station alongside the East Rail line to the mainland border. 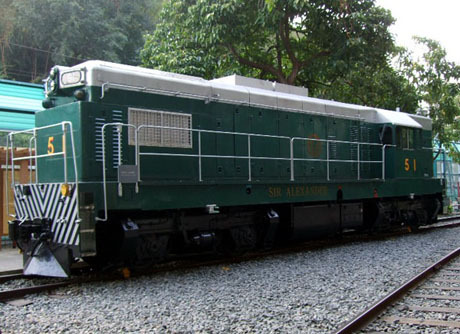 The museum is dedicated mainly to the history of the now defunct Kowloon-Canton Railway (merged with MTR in December 2007) and exhibits, some of which are outdoors, include an old steam locomotive, carriages, and various artefacts. Also a short walk from Tai Po Market Station through Wan Tau Kok Playground, on Wan Tau Kok Road lies the historic Old Tai Po Police Station, dating back to 1899, which closed in 1987 but has been renovated under the government's "Revitalising Historic Buildings Through Partnership Scheme" and reopened in August 2015 as "Green Hub" in partnership with Kadoorie Farm and Botanic Garden. The police station is of historic significance as as the first permanent police station in the New Territories and the site of the British flag-raising ceremony, marking the official British takeover of the New Territories. Both self-guided and guided tours are available. For more detailed information see "WHAT'S NEW". On completion of the tour there are frequent trains from either Tai Po Market or Tai Wo MTR Stations back to Hung Hom (about 30 mins) along East Rail with interconnections for other parts of Kowloon and Hong Kong Island at both Kowloon Tong and Hung Hom.